Nacházíte se: Booktook.cz → Odborná literatura → Cizojazyčné → Gastroenterologie, hepatologie → Yamada's Atlas of Gastroenterology, 5th Ed. Yamada's Atlas of Gastroenterology, 5th Ed. Access to accurate, high-quality images are vital for ensuring effective management of patients with GI complaints. The 5th edition of Yamada's Atlas of Gastroenterology sees the return of the gold-standard multi-media atlas that provides gastroenterologists with an outstanding visual tool covering all facets of the field. Every GI disorder from liver abscesses, endocrine neoplasms of the pancreas, to motility disorders of the esophagus are fully illustrated through the use of endoscopic ultrasonographs, computed tomography scans, magnetic resonance images, radionuclide images, and angiograms. Full colour throughout, it offers: *2500 outstanding images organised by disease entity and therapeutic modality including pathology slides, MRI and CT scans, endoscopy, EUS and open surgery. * Every image as an electronic file for download - perfect for scientific presentations. *28 downloadable high-quality surgical videos including transplantation and endoscopy clips, perfect for trainees to learn best practice techniques. * An outstanding international editor team, and 200 chapter authors each of which are internationally renowned experts in their field of expertise. 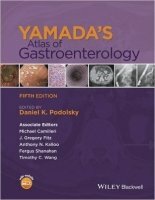 As the most comprehensive gastroenterology atlas available, Yamada's Atlas of Gastroenterology is the perfect resource covering all GI disorders, and an essential purchase for all gastroenterologists seeking to improve their knowledge and clinical patient management.